This is late winter for the newsletter and although I'd planned an update to the starbrary information, events of this severe winter have shifted the topic and focus to "transition". It just seems appropriate since everything is moving so fast and the energies are intense. This time of year is a period of transition from the extreme yin times of winter to the beginning of the rise of the yang times. The Earth awakens from its time of rest and enters the period of growth and beginning ... and like the Earth and the flora and fauna, we feel those changes. Yet, there are many transitions that occur throughout the year. There are obvious ones such as a new job (or loss of one), loss of a loved one, a financial loss (or gain), a change in a relationship, an addition to the family, an accident, etc. Some are more challenging while others are slight ... beware all those slight ones as untended, they build into more significant ones. Change and transition (or adaptation to that change) are all around us ... so much so that the only thing that is consistent is change! And it happens in spite of everything we do to prevent it if and only if it is meant to be part of our Karma. Sometimes, it is overwhelming, producing negative stress and all the resultant downside reactions to that stress ... and even a great change (like a marriage) can bring a load of unwanted stress. It is one thing to say "embrace the change" but quite another to actually get your arms around it! Sometimes help is necessary, like meditation, calming teas, soft music, cozy surrounding, a trip to Florida, but these aren't always possible if you are at work, on the subway, driving your car, etc. 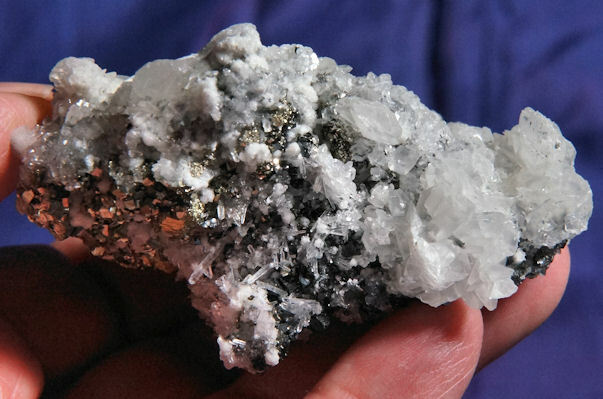 Crystals can help - you can take them anywhere, particularly the pocket-sized ones! And here are three of my very favorites ones for managing change, transition and transmutation. The Sardo smoky has a very curious shape not typical of most elestials ... some areas appear to to be all terminations, some curved and well-glyphed while in others, you will find some typical elestial expression that is sort of like a cross between a changeling and a dissolution quartz. 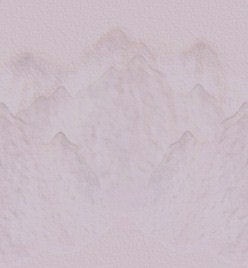 The smoky color is concentrated in the edges and when back-lit, the inner clarity and slight golden tones are apparent ... and in areas, the smoke looks like ancient writing! 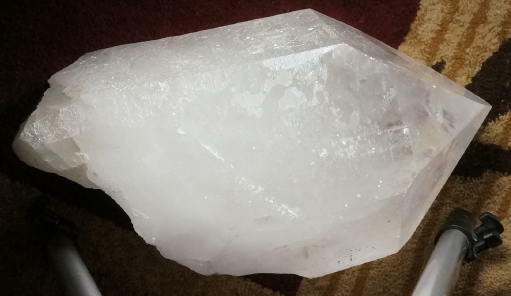 This is a new find from Brazil and without a doubt, this is a Spirit of Change and Transmutation, and one of great power at that - and I strongly recommend that when you first work with a Sardo, use a large grounding stone. In fact, it was weeks before I could allow one in the bedroom ... there is THAT much energy that you wouldn't expect from a smoky quartz! When first you work with one, sit with your crystal in both your hands and begin to study the beauty and form and then relate it to humans as a species. In the beginning, we were as the center of the crystal - ultra clear. Through the eons and countless lifetimes, we have sometimes lost touch with that clarity and allowed our Self to become dimmed and clouded. But as these sweet windows open, we can catch glimpses of that inner being and the clarity that was once our source Self. The Sardo allows that inner vision to once again, retrieve our own beautiful essence! But, just when you think you have reached the top, you realize that another peak has shown itself. As the Keeper has the desire and the will to become even more, but needs a guide, the Sardo will open that door and assist with the passage. Work with this Spirit slowly at first, and then increase the effort once your energies mesh. The Sardo is capable of very rapid change, so you must "slow it down" to your pace. The transition may be bumpy at first, but the change will be welcome and the transition necessary to your Being. Calcite is one of the most amazing crystals, largely due to the diversity of its various crystalline expressions. It forms in massive veins or crystalizes into "cookies", scalenohedrons or hexagonal barrels. When dropped or cleaved, it forms lovely rhombohedrons that display rainbows. The clearest of these are often called "Iceland Spar". 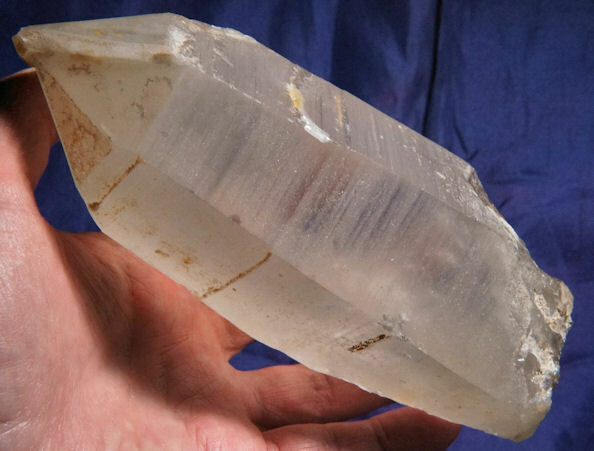 Calcite is a Change Master ... adapting, including, expressing. 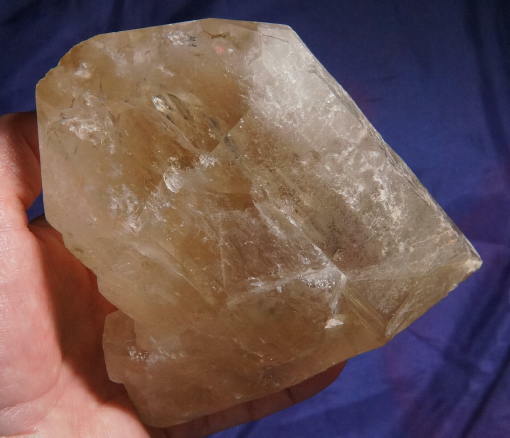 Calcite helps you deal with change and understand its necessity both in your physical life as well as your Spiritual expression in this incarnation. Change is a difficult thing for a lot of us - we fear and dread it. While we don't like the rut we are in, it is still our rut and we are comfortable in the predictability of that rut ... getting out of it only seems like a nice idea. Calcite allows you to see the rut for what it is, get you unstuck and into positive change that will help give zest and color to your life. You will find the whole concept of change to be welcome and gentle now! The different colors of calcite help you to hone in to where the change is needed most. Blue calcite deals with the need to speak your mind; green calcite allows for changes necessary in the heart; golden calcite is wonderful for energy changes and allowing the transition from the lower Chakras to the upper; white or clear calcite is perfect anywhere you need it! In spite of first impressions, changelings are terminated all over, shaped by the natural mineral acids within the Earth similar to the dissolution quartz and Kullu Rosie. When held to the light, the entire crystal has a movement that shifts and plays with the senses. The light does amazing things , allowing the mind to soar with imagination. There are nooks and crannies, spires and minarets, clarity and mystery, each crystal responding to the Earth changes in special ways and with special messages for their Keeper. Changelings are those who draw from their total source of inner strength during times of stress and literally become something else, but without losing that center core of knowing of who they really are. Native American hunters "became" the buffalo so that they could get close to the herd during the hunt. Others "became" the eagle so that they could locate the herds. It is possible for each of us to allow our consciousness to take another form so as to give us a different perspective, additional insight or more information, beyond what our own senses provide. That is the nature of the changeling Spirit ... assisting you in finding that aspect of Self that can run with the buffalo or soar with the eagle. It is a skill that can be learned and mastered with practice and dedication. And it is a skill that will allow a Keeper to blend when needed ... and stand out when necessary! As with any energy work, it is important to use good grounding stones when doing any change work! Hematite, black tourmaline, petrified wood, obsidian ... whatever your favorite is. Place at your feet when you meditate to maintain proper balance throughout the changes. And don't forget to smell the roses ... meditate outside if you can and mingle with the changes of the Earth ... celebrate the growth and embrace the difference! Please enjoy this wondrous season of transition!